Renowned Zambian Urologist Francis Manda has advised Management at his work place UTH to be sincere over the oxygen situation. Dr Manda says the oxygen crisis at the country’s highest health referral hospital has persisted and it is not fair for management to portray as if everything is alright. He said the institution is failing to do specialized surgical operations that need oxygen and wondered why the institution has kept quiet about the situation. 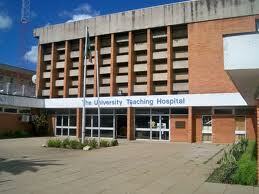 “I am surprised that everyone is quiet including the management at UTH when things are not well here,” he said.